We use Gmail everyday, do you get bored with the look of Gmail? 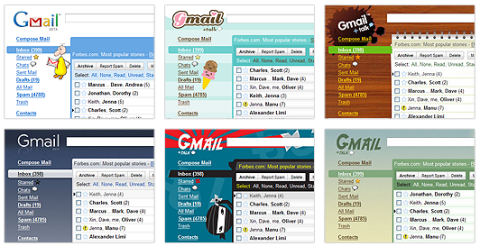 Would you like to have a new fresh look for your Gmail? Gmail fans have been building unofficial extensions to spice up their inboxes for a while, but up til now themes haven’t been an integral part of Gmail. Google wanted to go beyond simple color customization, so out of the 30 odd themes, there’s a shiny theme with chrome styling, another one that turns your inbox into a retro notepad, nature themes that change scenery over time, weather driven themes that can rain on your mailbox, and fun characters to keep you in good company. There’s even an old school ascii theme (Terminal) which was the result of a bet between two engineers — it’s not exactly practical, but it’s great for testing out your geek cred. To customize your inbox, go to the Themes tab under Settings. They will be rolling out themes to everyone over the next couple of days, so if you don’t see them yet, you probably need to wait a bit. Please feel free to tell us which one you like most. Are you guys sure that this is true? Hmm… it seems I don’t have this tab in my account. It’s probably not rolled out to all users, I don’t have it yet. I don’t see any themes tab? They will be rolling out themes to everyone over the next couple of days, so if you don’t see them yet, you probably need to wait a bit. I can change theme in my Gmail account now! I’m using a cute little number called Bus Stop, a theme which changes according to your location. Normally, there is a little person on the side holding ice creams stacked on top of each other, but when it rained yesterday, he was holding a stack of umbrellas instead. I love it. But but but….. I don`t have theme yet! Actually, I`m using my Gmail account for about 1year, but I still don`t have it! I wanna enjoy my gmail~! Tell me how to get the theme tab~! Go to “Settings”->”Themes” from your Gmail account.